Price: £7.99 (incl VAT) Sorry, this product is no longer available. Bioforce Helix Slim Drops made from organically grown fresh Jerusalem Artichoke. 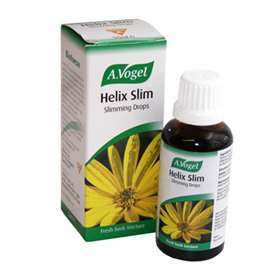 Bioforce Helix Slim is a natural herbal remedy that reduces hunger pangs and sugar cravings. Works to balance blood sugar levels, helps to eliminate toxins in the body, and is a prebiotic. Tincture to be added to water. Keeping blood sugar levels under control is very important. Eating on the run, prevents food from being digested properly. Calories are consumed but not all nutrients are correctly absorbed, leading to more hunger pangs soon after. Similarly, eating processed or denatured foods may feel like they've filled you up at the time but have poor nutritional value. This means you end up snacking, to keep yourself going in between meals. Eating erratically can make your blood sugar swing from high to low. This causes sugar cravings as your body tries to compensate. Keeping your blood sugar levels under control can help to minimise sugar cravings. Helix Slim contains fructans, helping to keep hunger pangs at bay, allowing you to reduce your calorific intake. Adults: 15 drops in a little water, 3 times daily. For best results take continuously for 12 weeks. Maintenance: 15 drops in a little water, once daily with the main meal. This remedy can be taken with thyroxine and other drugs that effect metabolism. This bottle should suffice for around 2-3 weeks at the recommended dose. Not recommended during pregnancy or when breastfeeding. This remedy is not designed to treat diabetes. Organically grown fresh tincture of Helianthus Tuberosus (Jerusalem Artichoke) roots. Extracted in alcohol (50% v/v). Product code: 30330 Price: £7.99 (incl VAT) Sorry, this product is no longer available.